This 45-page booklet is also part of a larger book "The Way to Ultimate Calm." 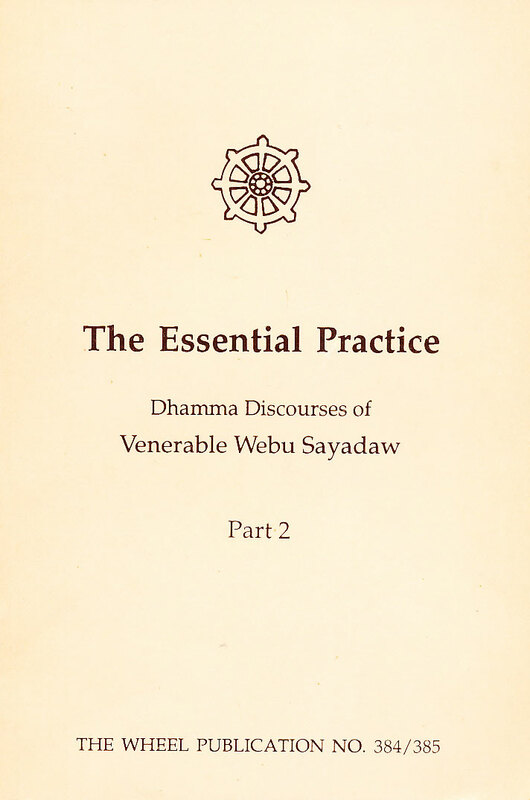 It is part two of two of the wheel series booklets of Webu Sayadaw's discourses. It features three discourses translated from talks given by the revered Venerable Webu Sayadaw to groups of lay disciples in the Burmese countryside. Included is a photograph of the Sayadaw and a discourse in which the respondent to the Sayadaw's questions (in question and answer didactic style) is Sayagyi U Ba Khin. The three discourses are entitled: "Extinguishing the Inner Fires," "Work Without Wavering," and "A Happiness that Ever Grows." Ven. Webu Sayadaw (1896-1977) was one of the most esteemed Theravada Buddhist teacher monks of recent times. Exemplifying the strict adherence to a simple meditative life, he constantly stressed the need to walk the Buddha's path to its final goal right here and now, in this precious but fleeting human existence. He was notable in giving all importance to diligent practice rather than to scholastic achievement. His teachings are distinctive in their simple and potent practicality. They constantly point the listeners to apply the Buddha's instructions through the sustained effort of meditation. The Ven. Webu Sayadaw and Sayagyi U Ba Khin had close Dhamma ties. The Sayadaw was the person who first exhorted Sayagyi to teach meditation (see Sayagyi U Ba Khin Journal by Vipassana Research Institute, p. 89, "Venerable Webu Sayadaw and Sayagyi U Ba Khin").